We rose at 5:40 and left our hotel in Bethlehem by 7:30 for a Eucharist at The Church of All Nations at the foot of the Mt of Olives. We had the use of the chancel which was covered in wonderful mosaics and had very good acoustics. On this day we were not seeking biblical sites but were travelling to Masada which lies on the western side of the Rift Valley, 2½ miles from the shore of the Dead Sea. On our descent from Jerusalem we paused at the point marking Sea Level where a camel was posing for photos. The rock fortress of Masada is ½ mile long and 220 yards wide and rises 2000 feet above the level of the Dead Sea. On arrival at the foot of Masada we were shown a video about the historical event which took place there before ascending by modern cable car to the top of the horst. In the year 40BC Herod the Great built a huge and magnificent fortified palace on the top “to protect himself from the Jews should they try to depose him’’. Inside there were store houses, barracks, arsenals, large cisterns for storing rain water and all kinds of royal accommodation. It was a masterpiece of engineering. Masada is the site of one of the most dramatic episodes in Jewish history. In the year 70AD Roman legions had subdued the whole of Palestine and a band of Jewish patriots fled to Masada which they captured. In the same year the Romans began a siege of Masada, which continued for three years and from the top one can see the outlines of sites of the 8 camps they occupied. A huge ramp 610 feet long was constructed on the western side up which to move a battering ram, in order to breach the walls. Rather than be captured and made slaves the Jews drew lots and killed the women, children and all the men. [Two women and five children who had hidden were the only survivors.] We found the remains of a synagogue on the top. After descending we drove north to Kalia for lunch then on to a beach side restaurant. Some chose to bathe [float] or paddle in the Dead Sea which lies 422m below sea level and is the lowest place on earth. Catherine went in but I contented myself with a paddle. After breakfast we drove to the top of the Mount of Olives to view the Place of the Ascension [Luke24:50-52] and to the Pater Noster Church where Jesus taught his disciples how to pray. [Matt 67-15] The Lord’s Prayer can be found on the cloister walls in over 100 different languages including Cornish. 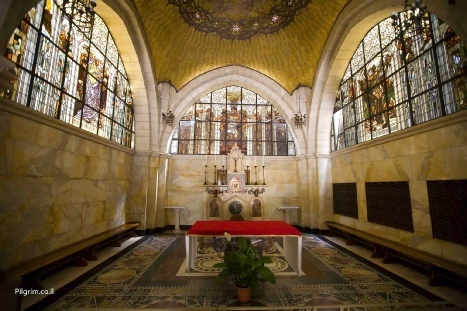 Our communion service was held in a garden chapel at Dominus Flevit Church. 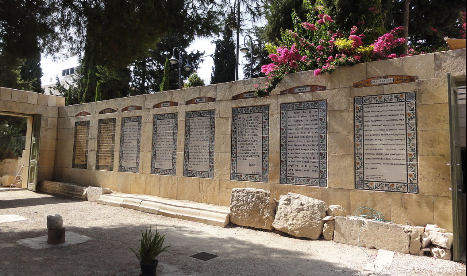 Here Jesus wept over the City of Jerusalem during his triumphal entry into Jerusalem on Palm Sunday and foretold its destruction. Our experience of this lovely spot was unfortunately spoiled by the presence of too many people. We continued walking down the hill past the Russian Orthodox Church of St Mary Magdalene. It is maintained by Russian nuns. Finally we reached the bottom of the hill where the Garden of Gethsemane is situated and where Jesus was betrayed and arrested. We went on by coach to visit the Wailing Wall [Western Wall] after we had been through a check point. It was very noisy and was decorated with balloons as the barmitzahs for boys and girls aged 13+ were being celebrated and bands were playing. Amongst all this the men, dressed in black coats and wide brimmed hats were praying, face to face with the wall. This is the holiest shrine in the Jewish world. As it is the last relic of the temple only men may come close to it. Feeling hot and tired we were pleased to go to lunch in a small restaurant, close to St George’s Cathedral [Anglican]. After lunch we went to Mt Zion, in Jerusalem, on foot, and first visited the Cenacle, the site of the Upper Room, in the remains of a fourth century Crusader Church. 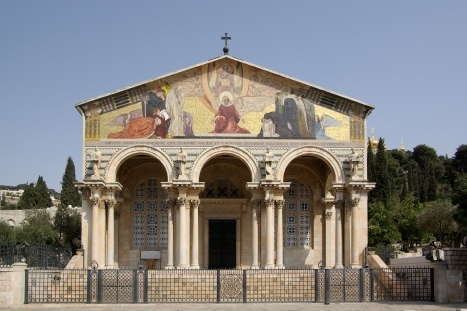 We continued to the Basilica of the Dormition, where it is believed that Mary ascended into heaven. 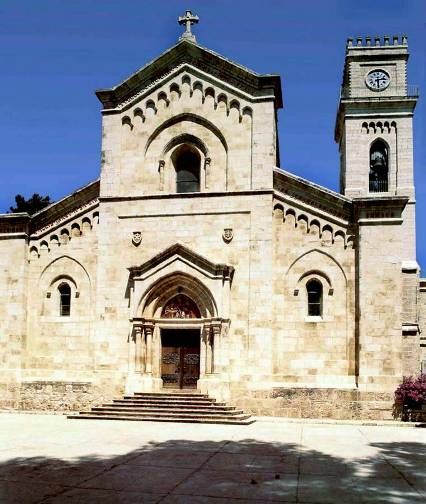 On again to the Church of St Peter in Gallicantu, which is built over the site of the house of the High Priest, Caiaphas. Here Jesus was imprisoned overnight, in a ‘bottle’ like cell, before his trial. [the only entry was through the top]. It is also where Peter denied knowing Jesus [Luke 22:54-62]. We saw the ancient steps down which Jesus and his disciples had walked to the Garden of Gethsemane after they had eaten the Last Supper. Passing once again through the check point which partitions Bethlehem from Jerusalem we reached the outskirts of the City. We walked through the Herod Gate, down uneven steps to the Church of St Anne and the Tower of Antonia where Jesus was tried. The Tower of Antonia was a fortress in Roman times. Mass was held in the Church of the Flagellation at 10am. Afterwards we watched a video showing the history of Jerusalem from the time of Jesus up to today. We walked on under the Ecce Homo arch [Behold the Man] and from 11am followed the Via Dolorosa, stopping in the street at the Stations of the Cross of which there are 14. At the first 10 we read the appropriate passages. The last 4 stations lie within the Church of the Holy Sepulchre. This Church holds the tomb of Jesus and many different religious parts of Christianity have their own chapels within it. The keys are held by Muslim caretakers. It was very crowded and I did not enjoy the visit. Lunch was eaten at a small café in the Old City. In the afternoon we had some free time for shopping or just soaking up the atmosphere, before returning to Bethlehem, for dinner and packing. After breakfast we checked out and were soon on our way to Abo Gosh to visit the Crusader Church of the Resurrection. This is one of the possible sites of Emmaus, where Jesus joined two of his disciples as they journeyed on the road to the biblical Emmaus. [Luke24;13-32] We celebrated Mass here at 9am. The church is run by French monks and has a beautiful garden and small shop. I bought some honey which I think the monks had collected and processed. We were to have gone on to Ein Karem, the birth place of John the Baptist and where Mary visited Elizabeth, her cousin. Unfortunately as it was a public holiday and roads were congested it was decided that we might get held up in a traffic jam. 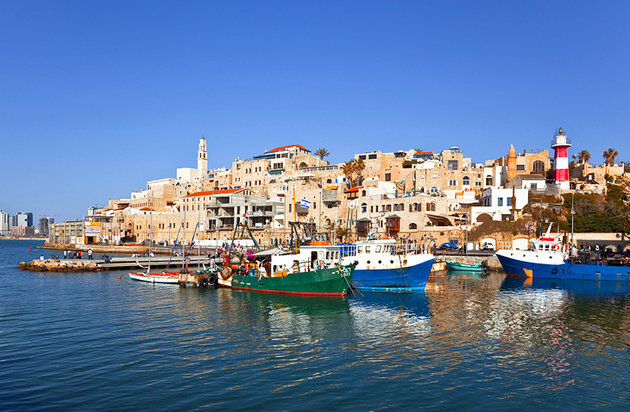 Instead we went to Jaffa, the old city on the coast just south of Tel Aviv and the airport. The group walked along the prom to the old harbour, passing the site of the home of Simon the Tanner. There were lovely views along the coast. Lunch was taken at a restaurant looking out to sea, after which we were taken to the airport. Our flight was 8:20 local time and we reached Luton after midnight. We were dropped close to home at 3:30am and I was feeling very unwell. It was a week of early rising and some days which were very full. Ideally one would like to spend at least two weeks for a visit to the Holy Land. However it remains a wonderful experience and brings one mentally and physically close to the Biblical account of Jesus’ ministry and Passion and I would thoroughly recommend it to every Christian to do at least once in their lifetime.